Earth Day Actions at DEP Offices: Six Actions at Six Locations Statewide! Actions happened in Pittsburgh, Norristown, Williamsport, Wilkesbarre, Harrisburg, and Meadville. In the shape of rallies, marches and boat parades, Pennsylvania citizens gathered with the same message: The DEP has not been doing its job. Read below to see the press, video, and pictures from each individual protest. – Pictures from the Event can be found here: Shadbush Collective photos on Flickr. – Check out this video of the boat parade! 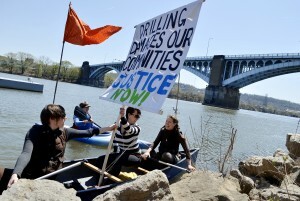 ← A Call to Action: Moratorium Action on April 30th! Thanks Richard! Actually we have been doing exactly what you suggest since 2009. Protecting Our Waters has been in the heart of the fight for the Delaware River Basin, galvanizing Philadelphia City Council to pass four resolutions pressing DRBC (Delaware River Basin Commission — our watershed agency) for the moratorium we still have, helping our coalition, led by Delaware Riverkeeper Network, generate 100,000 comments to DRBC, testifying at almost every DRBC meeting for years, and joining in the fight against pipeline damage in the Delaware River Basin. POW also was the first organization to send activists to testify against fracking at Susquehanna River Basin Commission (SRBC) meetings, before others like Earthworks and Sierra Club joined in; we’ve helped galvanize the effort to stop SRBC rubber-stamping approvals for fracking water withdrawals and continue to press SRBC on that issue, even meeting with them in Annapolis. When it comes to tactics, it’s important not to abandon the state in favor of only working with the watersheds, or vice versa — we have to choose the tactic which is most strategic at each moment, and since we won a major battle for the Delaware River Basin moratorium in November 2011, we’ve had a chance to do much more on the Susquehanna River Basin, statewide, regional and national fronts. Thanks Richard — we need people like you to keep raising consciousness because so many people don’t even understand what a watershed is, let alone how to organize watershed by watershed. Great idea. great compilation, thanks for the news round-up!